Chester County Det./Lt. 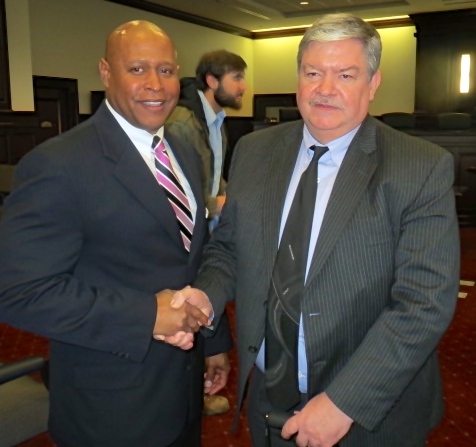 Kevin Dykes congratulates retired Coatesville Det. Marty Quinn on his selection as 2013 Law Enforcement Officer of the Year. Amid tough talk on crime and profuse praise for crime-fighters, recipients of the Chester County District Attorney’s Office annual awards displayed a talent for deflecting the attention. 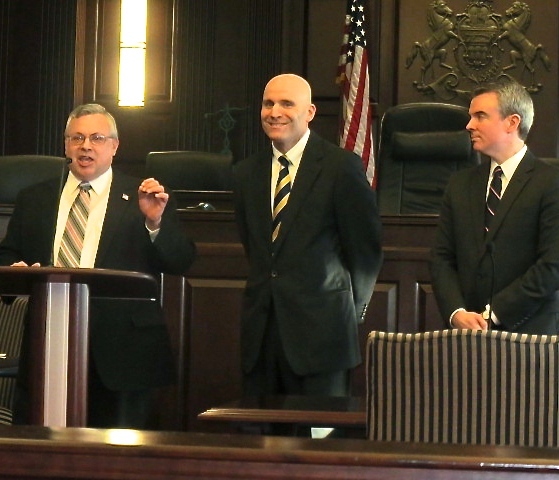 During a ceremony on Friday afternoon led by District Attorney Tom Hogan, he and members of his staff detailed countless examples of teamwork, integrity, and perseverance common among the three primary award recipients: prosecutor, county detective, and law-enforcement officer of the year. In response, the award-winners typically chose to credit their colleagues and family members for the recognition. County Detective of the Year Gerald Davis said he found inspiration early on in his career close to home: His father, brother, and uncle have all worked in law-enforcement. Davis, hired by the county in 2010 from the Parkesburg Police Department, said he now benefits from the “400 years of law-enforcement experience at my fingertips” when he walks into the office each day, citing the collective knowledge of his co-workers. Chester County Detective of the Year Gerald Davis (second from left) is joined by his wife, Denise (from left); his father, Gerald Davis Sr., a retired Philadelphia Police detective; and his brother, Michael, a 15-year veteran of the York Police Department. “It really is a whole lot of people” who deserve kudos for helping him do the job, he said, especially his wife, Denise. On more than one occasion, “she had to take over flipping burgers on the grill” because of a police call, he said. Often, when Davis, who is assigned to the District Attorney’s challenging Child Abuse Unit, left his own family, he ended up helping someone else’s, Hogan said. “You can’t see them, but there are 1,000 children standing behind me that are saying thank you … and applauding him as the Chester County Detective of the Year,” Hogan added. 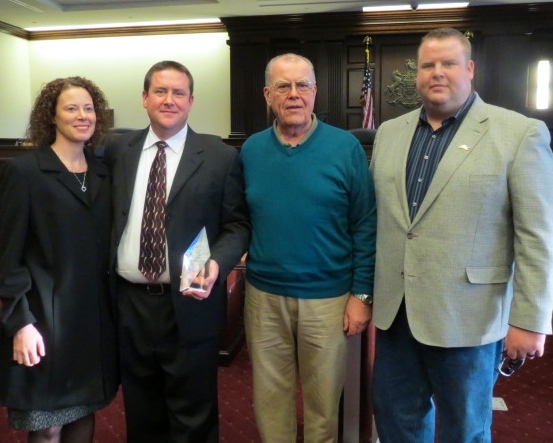 First Assistant District Attorney Michael G. Noone introduced Chief Deputy District Attorney Nicholas Casenta as the Prosecutor of the Year. Noone explained that Casenta, a 27-year employee who heads the Appeals Unit of the office, works tirelessly behind the scenes to ensure that convictions are not overturned, an expertise that has earned him respect far beyond the county’s borders. Chester County Chief Deputy District Attorney Nicholas Casenta (from left) accepts the award for Prosecutor of the Year from District Attorney Tom Hogan and First Assistant District Attorney Michael G. Noone. In praising the career of retired Coatesville Det. Marty Quinn, Hogan – one of four speakers who regaled the audience with anecdotes about the 2013 Chester County Law Enforcement Officer of the Year– issued a warning: Quinn, known for actively avoiding the limelight, was not likely to be as effusive as the other recipients. Quinn’s award would differ in another respect since he retired months ago. But Hogan said Quinn’s impact would be felt for years to come. Many of the complex cases that Quinn investigated have not yet concluded, Hogan said. Known for his dogged, fearless work ethic and an unmatched memory, Quinn was a force to be reckoned with for more than 27 years in Coatesville, where he knew nearly everyone, Hogan said. Chief Deputy District Attorney Ron Yen, last year’s Prosecutor of the Year, called Quinn a valuable asset to law enforcement. “My successes all directly related to Marty’s efforts to crack cases nobody else could crack,” Yen said. Chester County Det./Lt. Kevin Dykes said he began working with Quinn in 1982 and has witnessed the “phenomenal impact” Quinn had on numerous investigators. “He did it by leading by example,” Dykes said. Hogan said he remembered one court exchange between Quinn and a defense attorney, who thought he could discredit Quinn’s identification of his client since their encounter had occurred primarily when the suspect was running from Quinn. Asked how he could be certain of the ID, Quinn responded: “Because he ran just like his father did and grandfather did.” The answer helped secure a conviction, Hogan said. For his part, Quinn chose not to make a liar out of Hogan by launching into a lengthy speech. “This is going to be short,” he began, eliciting laughter. But he couldn’t resist good-naturedly questioning Hogan’s honesty. In addition to the three main awards, the Chester County Commissioners received a District Attorney’s Commendation for their ongoing commitment to law enforcement. Commissioners Ryan Costello, Kathi Cozzone, and Terence Farrell were honored for supporting the Chester County Public Safety Training Center, updating the Chester County emergency radio system, and expanding the Chester County Detectives’ resources for child abuse investigations and computer forensics. Representatives of the Chester County Prison and police departments in Phoenixville, West Chester, West Goshen, and West Vincent also received commendations for their work on some of the county’s recent, high-profile cases.